After the Flood, God promised Noah that Earth would have predictable patterns of climates and seasons: “While the earth remains, seedtime and harvest, cold and heat, winter and summer, and day and night shall not cease.”1 This promise is trustworthy because God is trustworthy, and He controls Earth’s climates and seasons. This promise is trustworthy because God is trustworthy, and He controls Earth’s climates and seasons. 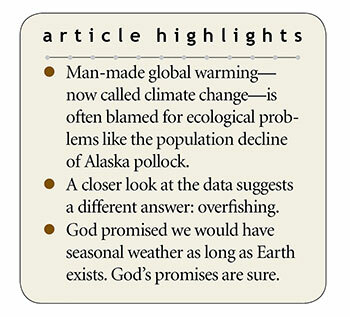 But recently God’s promise has been distrusted, doubted, and denied by many who assert that human activities are so out of control we should fear the loss of previously stable climate patterns. In effect, these alarmists ignore God’s promise and His sovereign control, as if humans can determine the destiny of Earth’s climate. But what if government reports support notions of man-made global warming and an upcoming climate crisis? Would that prove God has lost His stabilizing grip on Earth’s environmental parameters? Consider the Alaska pollock, the cod-like whitefish some say is now the number one money finfish in America’s food industry. Huge pollock populations once filled certain areas of the Bering Sea and North Pacific, but the southern edge of their range is shrinking. Some suggest the pollocks are migrating north due to climate change.2 Is this the case? 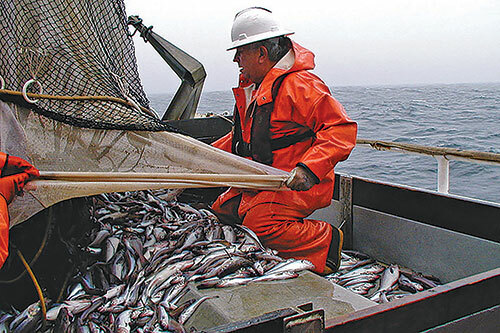 Pollock are sorted on board the NOAA ship Miller Freeman during a 2007 assessment. Image credit: Copyright © 2007. I. Spies. Alaska Fisheries Science Center. Used in accordance with federal copyright (fair use doctrine) law. Usage by ICR does not imply endorsement of copyright holder. Government databases on the fishing industry rely on at-sea reporting that includes inspector monitoring of fishing quotas.2 However, the information the inspectors collect can be unreliable. Dishonest commercial fishermen habitually underreport catches, deceptively circumventing inspector audits. Commercial fishing motherships often obstruct or evade monitors, sometimes reporting only half the catches received.1,3 Consequently, government databases misreport the real situation. Should further research, farther north, be looked at to see if climate change is really causing the pollock population to migrate northward? Could it be the cause-and-effect reality is embarrassingly simple and overlooked6 as evolutionists rush to blame global warming for yet another ecosystem alteration? Despite what popular science purports to show, we can rely on God’s Word. This is but one example of how careful fact-finding refutes global warming alarmism, corroborating God’s promise in Genesis 8:22. Despite what popular science purports to show, we can rely on God’s Word. Genesis 8:22. Notice that God made this climatology-relevant promise to both humanity and the animals who survived the Flood. Bailey, K. M. 2013. Billion-Dollar Fish: The Untold Story of Alaska Pollock. Chicago: University of Chicago Press, 2-44, 46-88, 199-215; quotation from page 16. Miles, E. et al. 1982. The Management of Marine Regions: The North Pacific. Berkeley, CA: University of California Press, 160-165, 172, 184-193, 220-223; Kasahara, H. 1972. Japanese Distant-Water Fisheries: A Review. Fishery Bulletin. 70 (2): 227-282. Guliuzza, R. J. 2009. Consensus Science: The Rise of a Scientific Elite. Acts & Facts. 38 (5): 4; Johnson, J. J. S. 2015. Forensic Science Frustrated by “Peer Review.” Acts & Facts. 44 (2): 18; Johnson, J. J. S. 2015. Cherry Picking Data Is the Pits. Acts & Facts. 44 (7): 19. See also Proverbs 20:10, 23; Micah 6:11. Johnson, J. J. S. 2014. Pine Needles, Limes, and Other Simple Solutions. Creation Research Society Quarterly. 50 (3): 193-194. Cite this article: James J. S. Johnson, J.D., Th.D. 2018. Something Fishy about Global Warming Claims. Acts & Facts. 47 (3).